KAMPALA – The Anti-corruption court in Kampala will in the afternoon of Thursday, August 30 hand sentences to former Uganda National Roads Authority Director of Finance Joe Ssemugooma and two others found guilty of causing financial loss to the government. 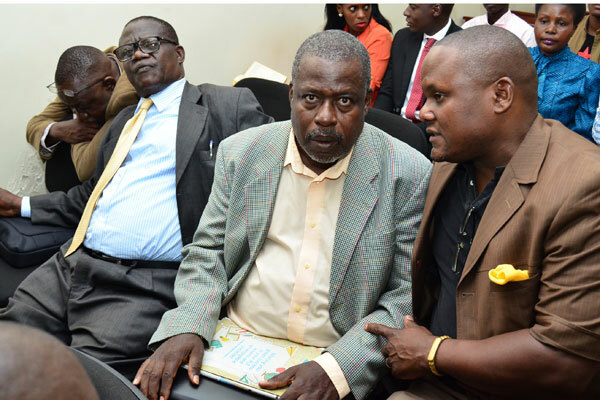 Mr Ssemugooma was convicted together with businessman Appolo Senkeeto alias Mark Kalyesubula who was the country representative of Eutaw Construction Company, which is accused of fleecing UNRA of Shs24.7 billion in the bungled Mukono-Katosi road contract. Also convicted was Wilberforce Senjaako, a former UNRA accountant found guilty of neglect of duty by failing to verify securities before approving an advance payment of 24.7 billion shillings to EUTAW company. Justice Lawrence Giddudu, who in the same verdict on Wednesday, August 29 morning acquitted former works minister Eng. Abraham Byandala on all the three counts including corruption, abuse of office and disobeying lawful orders indicated he would hand the conviction sentences on Thursday. Justice Giddudu also acquitted the former UNRA Executive Director Ssebuga Kimeze and Legal Counsel Marvin Baryaruha of any liability in the matter. Delivering his verdict, Justice Gidudu said businessman Apollo Senkeeto was guilty of stealing the entire amount of Shs 24.7 billion which he had access to by falsely representing himself as the country director of EUTAW Mississippi in Uganda whereas not. The judge described Mr Ssenkeeto as a smooth operator whose actions would be understood after a critical examination and he would switch roles to serve his purpose. “He could be a messenger and courier to peddle forged bank guarantees, a company director to be a signatory at the bank accounts and a country representative to attend meetings”. Mr Ssemugooma was found guilty of abuse of office by approving payment of Shs24.7 billion to EUTAW before verifying securities. The court further convicted Wilberforce Senjaako of forgery of bank security guarantees and performance bonds which Mr Ssenkeeto uttered to UNRA for purposes of fraudulently accessing the Shs 24.7 billion. The convicts on Wednesday pleaded for lenient sentences and non-custodial sentences because they are family men who are sole breadwinners for their wives and children. Prosecution however sought for deterrent sentences pleading with court to send a warning to other would be offenders. Court resumes Thursday afternoon to hand down the sentences.